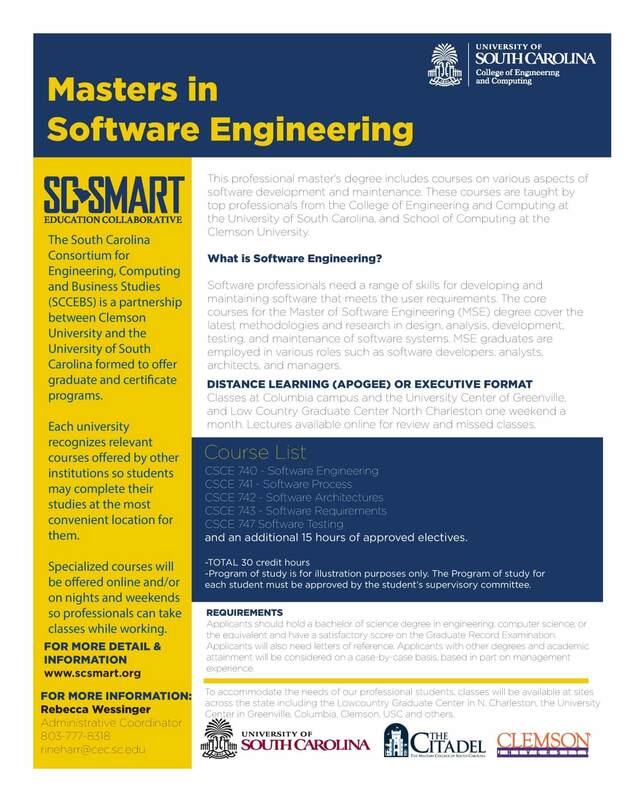 The Master of Software Engineering degree provides instruction on the latest methodologies and research in design, analysis, development, testing, and maintenance of software systems. The degree is aimed at those who wish to pursue a career as professional software engineers. For students who have adequate experience in software development or maintenance, the M.S.E. degree requires 30 hours of course work consisting of 15 hours in required software engineering courses, 15 hours of approved electives and satisfactory completion of a comprehensive software engineering exam. Students must also submit a report on some aspect of software engineering that demonstrates mastery of the subject and a high level of communication skills. Students not having one year of experience in software development or maintenance will be required to take CSCE 793 Internship in Software Engineering as a prerequisite that must be completed before the degree will be awarded. More information at USC @ UCG.